Egyptian authorities have imposed a curfew in Cairo to curb street protests after the military sent tanks and armored troop carriers to the capital to quash the violence. Several tanks are guarding the area in front of the presidential palace, while hundreds of people are streaming into Cairo downtown defying the freshly imposed curfew. Earlier in the day, the presidential office ordered a huge crowd of protesters remaining in the square in front of the palace since night time to clear the area by 3:00pm (13:00 GMT). After that deadline a curfew was re-imposed in the capital, resulting in an effective ban on demonstrations. 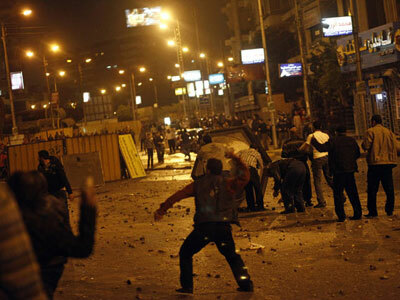 The move comes less than six months after curfew was victoriously lifted to mark the end of Hosni Mubarak's rule. Ahmed Agor, a protester injured in Wednesday's violence, told RT he does not believe tanks will choke the demonstrations. Meanwhile, Morsi's family was forced to evacuate from their house in al-Zagazig, a town 47 miles (76 km) northeast of Cairo, after hundreds of protesters gathered outside the residence to slam the authorities' "poor perfomance" curbing the recent unrest, Al-Mayadeen TV channel reported. Police used tear gas to disperse the demonstration in al-Zagazig, which soon grew into scuffles between the president's supporters and opponents. At least 17 people were injured there, reports RT's correspondent Paula Slier. Six people have been killed in Cairo in the protests so far – including journalist Al Hosseini Abou Dief, who died from a shotgun wound – and over 450 were injured during the ongoing clashes between protesters and government forces, Ahram Online estimated. The Egypt Independent newspaper claimed that two of the dead were a woman and teenager. 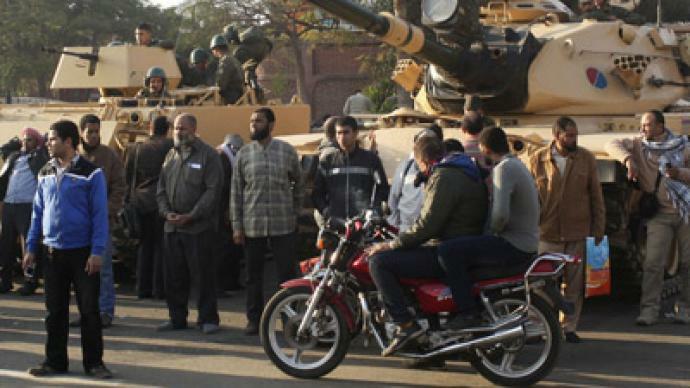 Egypt’s Interior Ministry also reported that 32 people were arrested. The clashes mark the worst violence in Egypt since the recent crisis erupted on November 22, when President Morsi assumed vastly expanded powers and started pushing for a vote on the country's new consitution. 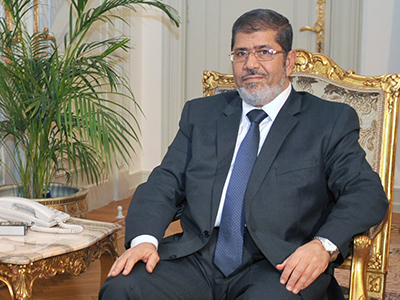 ­The Muslim Brotherhood says it and supporters of President Morsi detained 83 opposition members on Wednesday night in and around the presidential palace, reports Ahram Online. Those seized were allegedly carrying weapons and Molotov cocktails. After detainment, the suspects were not handed over to the police until prosecution and forensic experts inspected evidence. "The 83 'thugs' were arrested with money, white weapons and Molotov cocktails," Brotherhood lawyer Abdel-Moneim Abdel-Maqsoud says. "They admitted causing riots and killing and injuring hundreds of [the president's] supporters." 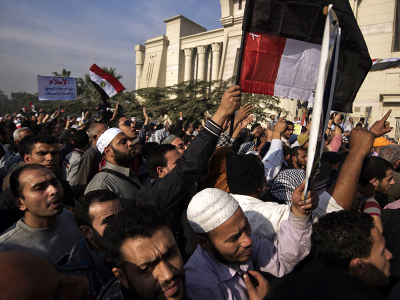 The report provoked anger among anti-Morsi demonstrators who remained in front of the Ittihadia presidential palace in Cairo. “They called us thugs, and we're university students," the crowd chanted as quoted by eyewitnesses posting on Twitter. “I will not participate in a referendum that spilled Egyptian blood, I call on Morsi to cancel the constitutional declaration immediately,” Ahram Online quoted El-Balshi as saying. The volatile situation has also led to the resignation of five more of Egyptian President Mohamed Morsi’s advisors, including Seif Abdel Fattah, Ayman Sayyad and Amr Leithy who quitted Wednesday over the violence. Mena news agency reported a further resignation on Thursday. 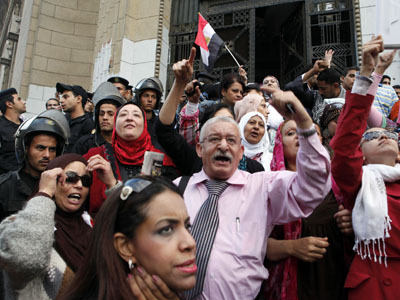 Three others did so last week to protest Morsi's November decree. The recent protests engulfed Egypt after newly elected President Morsi signed a decree granting his office vastly increased powers, also stripping the judiciary of any chance to challenge his decisions. 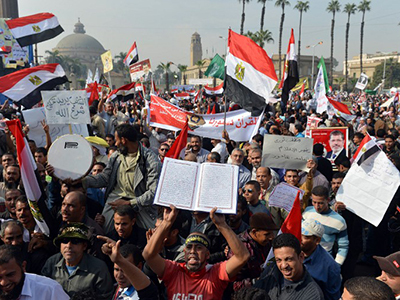 Protesters claim this is akin to the authoritarian rule of ousted President Hosni Mubarak. Journalist Wael Eskandar told RT he was worried that the government would not be able to deal with the ongoing clashes. 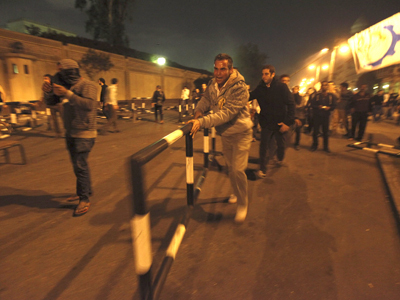 The anti-Morsi protesters were being chased away by Muslim Brotherhood supporters who were using rocks, Molotov cocktails and even “shotguns,” Eskander said.